From "The Gowanus Circus 3rd Anniversary Show" at The Muse Brooklyn. Custom-built, Mosher's Aerial Triangle is perfect for warehouse performances. Taken at BangOnNYC's "Creatures of the Night". Performing in "Carnival of the Animals" with Children's Dance Theatre. Taken during a show with "The Gowanus Circus" at Big Sky Works in Brooklyn. Duo Aerial act with "The Gowanus Circus" at The Gowanus Ballroom. From a performance with The Gowanus Circus at The Gowanus Ballroom. Taken at the Mosher Castle in 2011 and featured in Mobile Bay Magazine. Playing around with Iced Ink at Oxheart at Third Ward. Performing with "Modern Gypsies" at Lava Night Club. "Advanced circus arts might not be for everyone, but everyone can benefit from a little circus in their life. Circus arts teaches us to push our personal boundaries, learn more about ourselves, and provides a new perspective on life. Circus has taught me to embrace what I once thought as chaos and turn it into adventure. I love sharing my experiences and I love watching others go on their own journey." Megrez Mosher grew up in the fairy tale Mosher and Sheldon Castles in Fairhope, Alabama. She split her time dancing in her mother's dance studio and climbing trees in her backyard. Mosher spent her teenage years traveling as much as possible, wanting to absorb as much information and explore the world in order to tell stories with an open heart and mind. After finishing high school in Utah, she attended Pacific University of Oregon studying Poetry, Theatre and Dance. In 2011, Mosher moved to Brooklyn, New York. Where she immediately discovered Circus, and after one class she was asked to start performing in local venues and galleries. 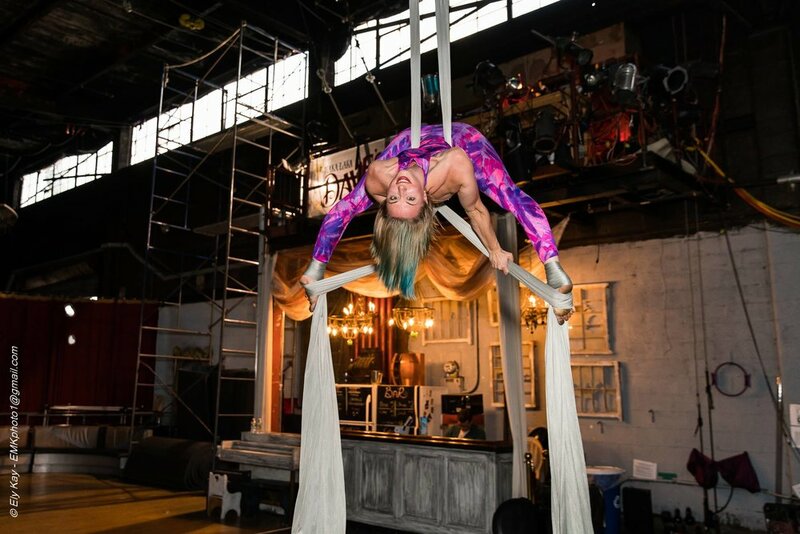 Circus arts became a total obsession, leading her to become a Certified Personal Trainer with ISSA in 2013, to train at the famous Circus Warehouse the Muse Brooklyn and House of Yes, become an Aerial Yoga instructor with Om Factory NYC, and co-found The Gowanus Circus in Gowanus, Brooklyn. In 2015, Mosher began to put together the idea for Kudzu Aerial, in Fairhope, Alabama, with the intention of only teaching seasonally to introduce recreational circus arts to all. The studio grew quickly, and now Mosher is dedicated to the growth and expansion of Kudzu Aerial by continuing her fitness education, circus training, and growing her business. Since the studio has opened, she has taught over 1,500 aerial classes. In order to maintain a program that benefits all her students in body and mind, she has partnered with several medical professionals in the area as well as allied herself with the American Circus Educators and ISSA as well as bringing in guest artists and instructors from multiple circus backgrounds. Megrez has trained with Brett Womack (of Womack and Bowman), Michelle Arvin (formerly Cirque Du Soleil), Jan Manke along with teachers and trainers at the Muse Brooklyn and Circus Warehouse. When she is not in the studio, Megrez lives in Fairhope with her husband, David (both are annual passholders at Disney). She loves to read books on circus history, philosophy and mindfulness, go on impromptu roadtrips and drinking suspicious amounts of coffee.